Add the spices, fry for a few secs and add purée and yeast extract. Bubble together for 2 mins, then add lentils and coconut cream. Cook until lentils are tender, then add the broccoli and cook for 4 mins. 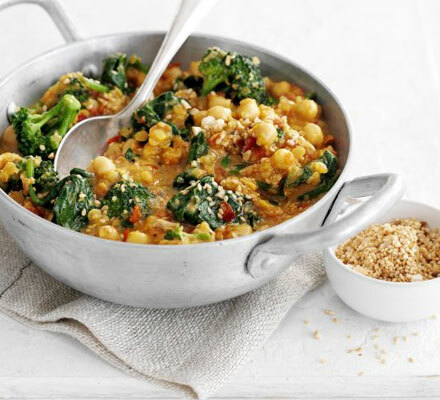 Stir in chickpeas and spinach, squeeze over lemon and swirl through sesame and cashew mixture. Serve with brown rice, if you like.